We have been running trips to Finland since we started and there’s no doubt this country offers the wildlife photographer endless opportunities. Each year we discover new sites and opportunities and look to incorporate them into a different trip and this is no different. 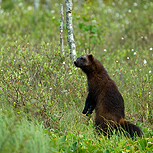 Alongside probably the best site in the world to photograph the amazing and elusive Wolverine and a long-established and equally impressive site for the powerful European Brown Bear we have added the opportunity to work in a fantastic new hide for working with the normally shy Beaver at their lodges. The water level opportunities are superb and at this time of the summer, the young kits should be visible and playful too. This is a new and exciting combination of northern summer species to photograph in a busy week. Day 1: We travel to Kajaani airport in Finland where we will collect our transport for the trip and make our way to our Russian border base for the chance to get some dinner and a good nights rest after a full days travel. Days 2 – 3: After a day of acclimatising and generally exploring the local area at leisure, we will have the first of 2 nights in our small 2-person hides here where our focus will be bears. By this time of the summer with the mating season generally over, our location here is one that is particularly frequented by large male bears, which provide some stunning individuals to work with in different settings for this and the following night. We will enter the hides at the end of the afternoon and leave the following morning so will probably spend our downtime on day 3 catching up with some rest. Day 4: After our second night with the bears we will travel to the town ok Lieksa where we will be based for the next 4 nights. We have chosen to base ourselves in the town itself as it will give us flexibility to split into two smaller groups and head to each of the 2 different locations where we will be spending two nights each over the course of our time here. Some of us will go to our purpose-built floating hide to look for Beaver: they are at their most active during the night and so with almost 24-hour daylight at this time of the year this will involve heading to the hide in the afternoon and coming out the next morning. The same pattern will apply to the static Wolverine hide as well. We will have the first of our 4 nights in the respective hides tonight. Days 5 – 7: Over the course of these days we will continue to rotate around the two different locations so that everyone will get the chance to spend 2 nights at each. There will be a chance to sleep/rest during the daytime between sessions, and all the hides have sleeping areas, so you can get some rest when you are over nighting in the Beaver or Wolverine hides too. Day 8: After our final night in the hides and breakfast back at our hotel (and the chance to freshen up too) we will be returning to Kajaani airport for our flights home. Accommodation, all local transport, entry fees and all meals. Accommodation is in comfortable and traditional hotel-style rooms throughout. The walks to the hides are only short so not challenging. Days in the appropriately equipped hides can involve up to 10-hour sessions, so a decent level of stamina is necessary and appropriate clothing and footwear too.